• Healthy couples who are hoping to stay that way. This option is for healthy couples such as those considering a commitment or marriage, or couples who feel good about their relationship but know that it’s important to continue to prevent issues from surfacing.This path is designed to offer couples a basic relationship health checkup. You can validate that “Yes! Our relationship is strong and on the right track!” And, like most healthy couples, you will learn more about what could make your already good relationship even better. • For couples struggling with the connection, communication, specific issues such as family or origin boundaries, relationships with ex’s, constant conflicts and misunderstandings, etc… This is a great tool to help you access the heart of your relationship issues quickly and effectively. You can expedite the counseling process, or possibly gain the insights and strategies you need to begin working on your relationship without pursuing professional assistance. 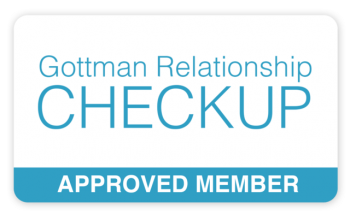 The Gottman Relationship Checkup is a great way to get a very detailed overview of your relationship, as well as a detailed roadmap of where to begin focusing your efforts to improve your relationship. You will receive separate (private) reports for each partner with specific steps to get you moving in the direction of a “better us,” as well as a relationship overview for you to explore as a couple.